This book is pure fantasy for me. I love to entertain but our parties tend to run to burgers on the grill with kids running all over and the adults finding a quiet spot to eat. I think my parties are fun but wow, they are nothing like the beautiful scenes in this book. This is what I aspire to as time and resources allow. Not all the time, I still like the burgers and the running kids but sometimes the elegance of these place settings would be so fun and satisfying. 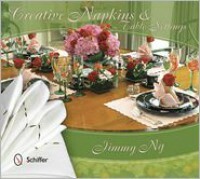 Jimmy Ng shows ways to fold a napkin that I couldn’t have imagined. Every example has a gorgeously photographed picture and step by step instructions. I didn’t know napkins could do some of the things he shows! He has examples for baby showers, Fourth of July dinners, weddings and dinner parties. He has Easter and St. Patrick’s day, just about any occasion you would give a dinner for. I think if I owned the proper napkins and had that little bit of extra time, I could actually do this. At least the book makes me think I could do this and that’s what this type of book should do. Inspire me to do more than I’ve done before. He also shows wonderful place settings that give me plenty of ideas on how to use some of those things that I never pull out of the china closet. We’re hosting Easter, Thanksgiving and Christmas at our house this year and I’d really like to try some of these ideas. I’d like to see if I could bring a little bit of this fantasy to my dining room. Provided by Netgalley for an honest review.